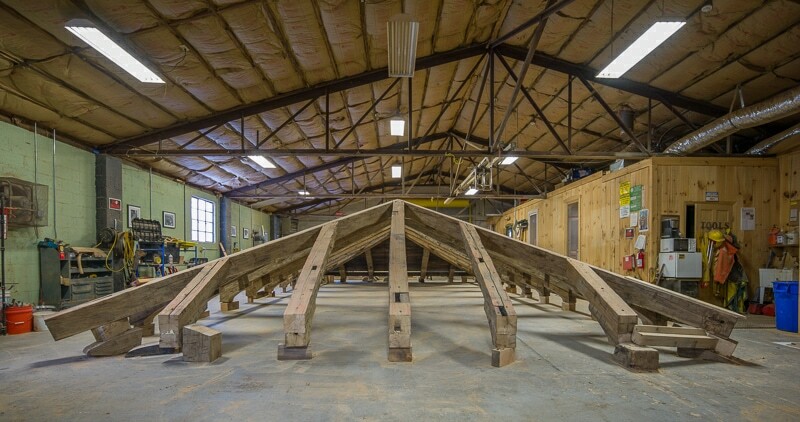 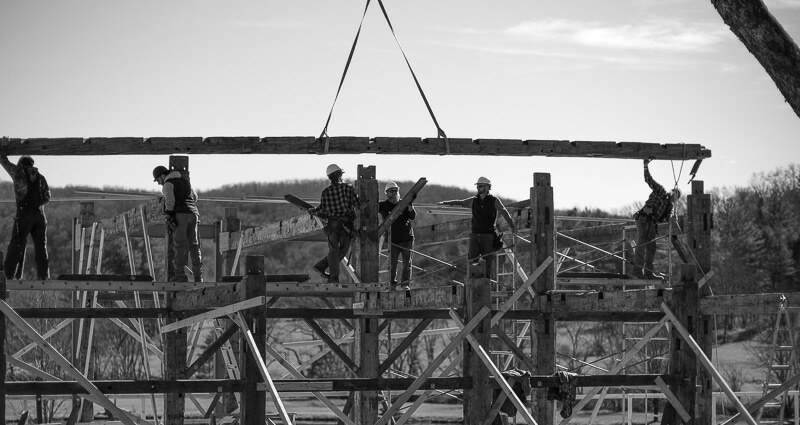 A working cattle farm on the New River, rich in flora and fauna…a marriage of modern amenities cloaked in old reclaimed wood…while inside fine art and fine craft engage in dialogue and soliloquy. 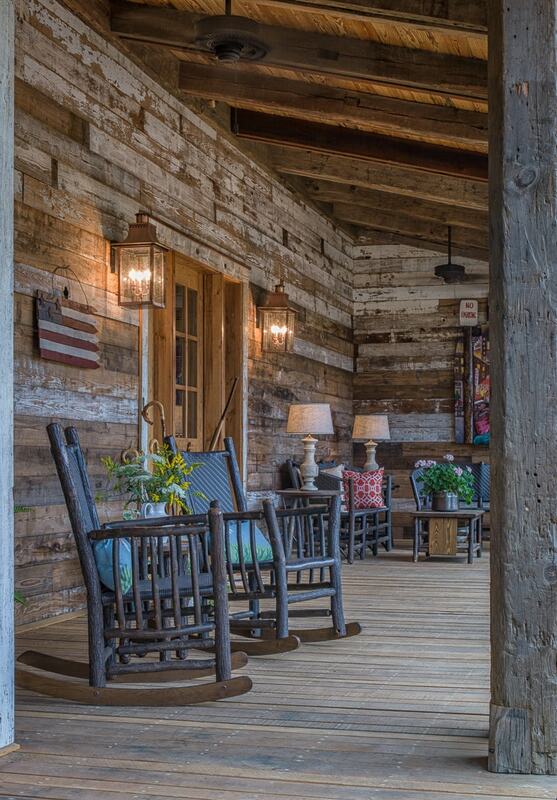 A reclaimed wood wall is one of the best front porch ideas we’ve seen. Leaving the old weathered paint on the reclaimed siding is what makes it work. 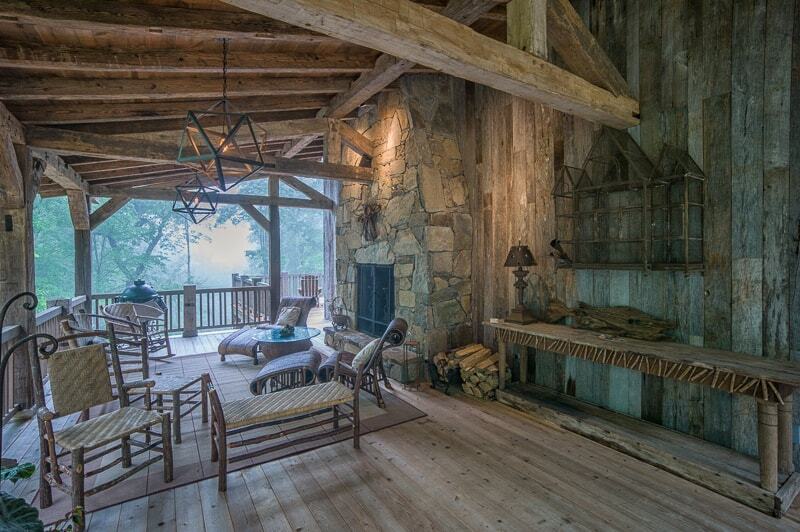 Reclaimed wood post and beams, locust decking, and two rocking chairs complete this inviting porch on the New River. 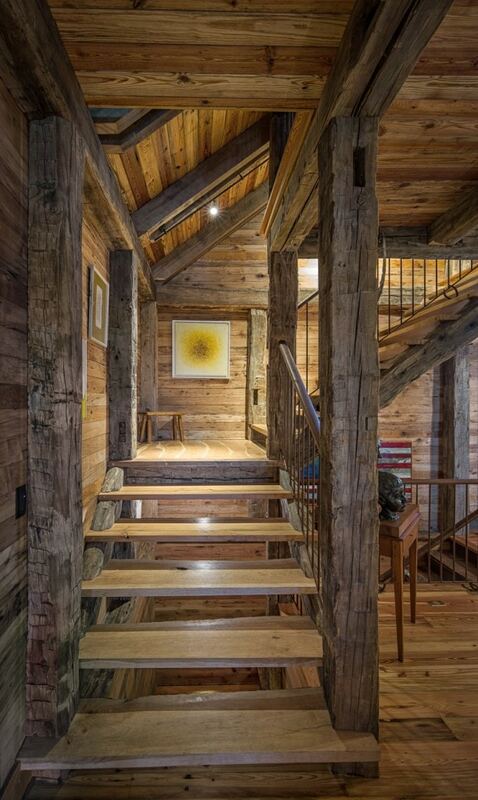 One of the focal points of this home on the New River built almost entirely from reclaimed wood is the reclaimed wood stairs leading to the loft. 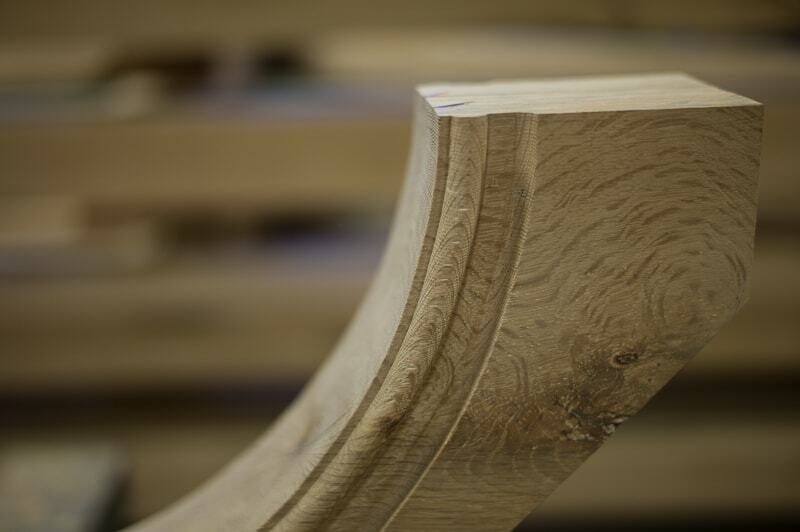 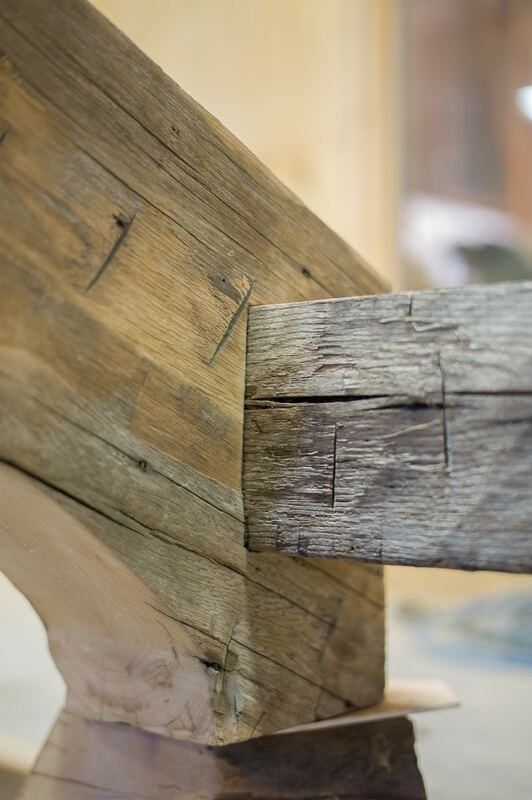 If you look carefully, you can see that the landing is crafted using a single reclaimed board cut into sections and hand-scribed to its mate. 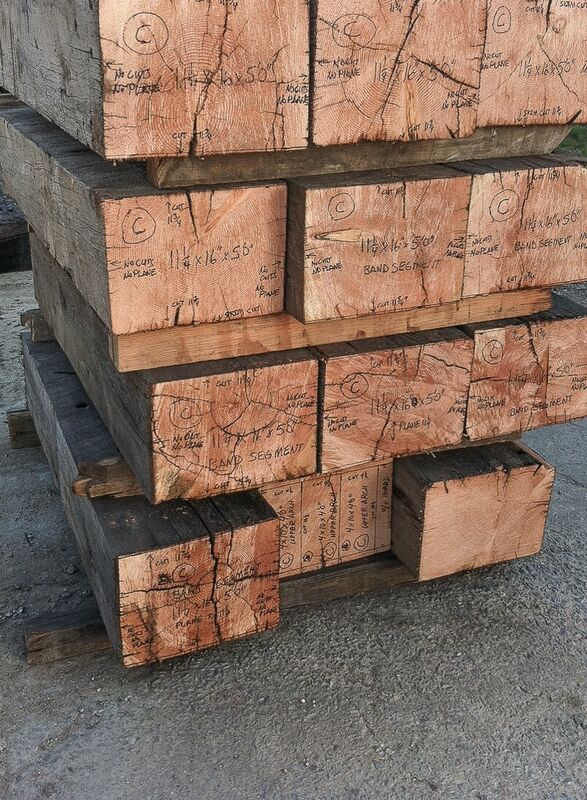 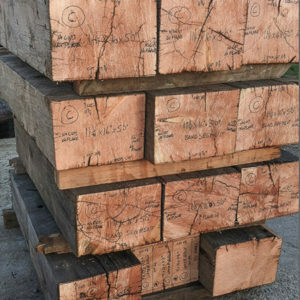 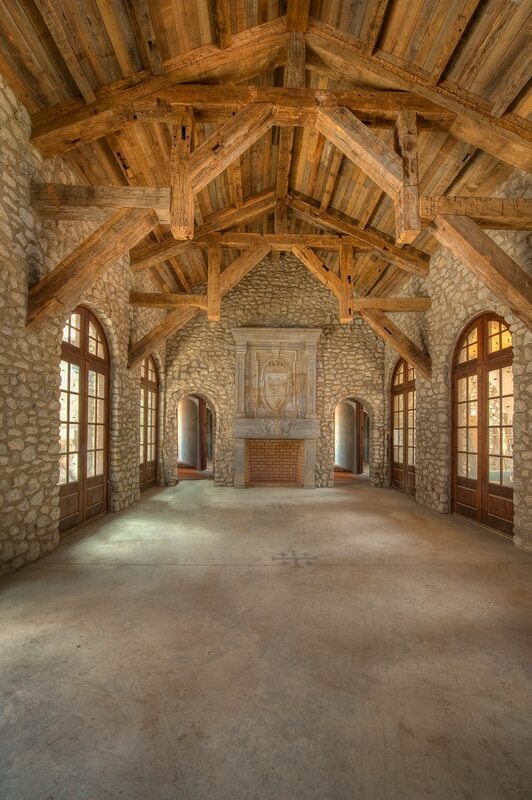 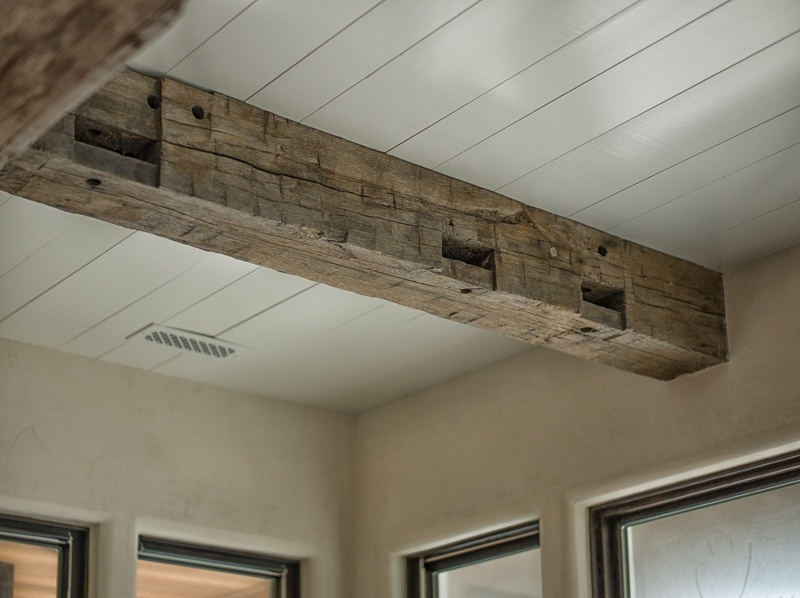 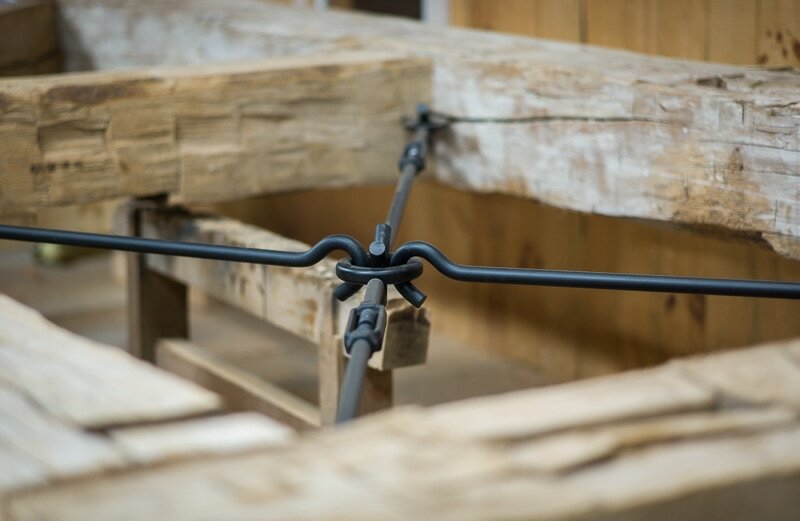 Old weathered beams remind us of driftwood–the way time and elements over a hundred years have worn down the rough hewn texture to a patina and texture impossible to perfectly duplicate on new wood. 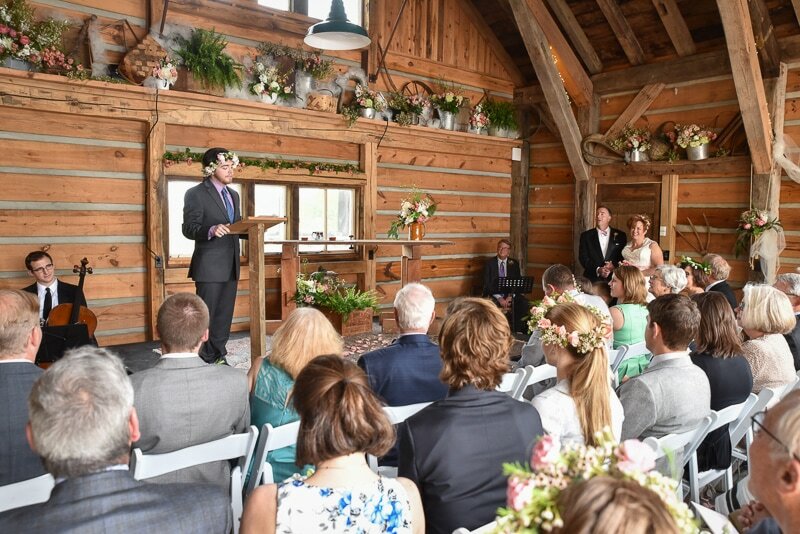 Yes, that’s Eric Morley at his wedding to Gesche Metz in (what else) a timber frame barn! 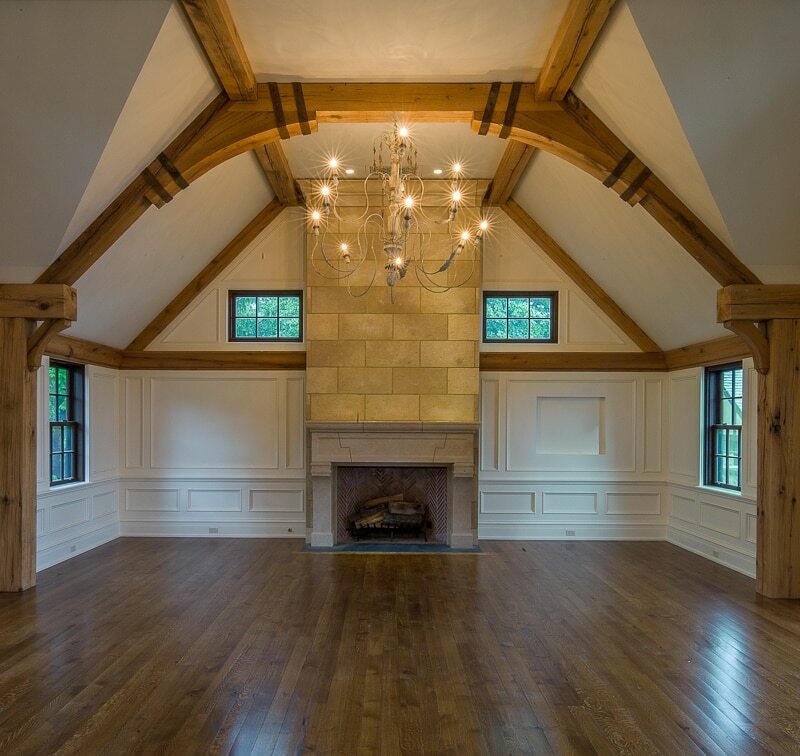 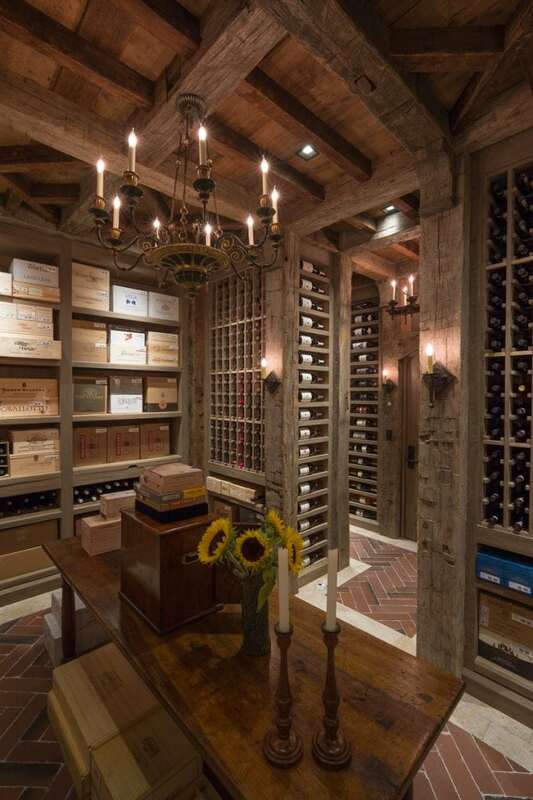 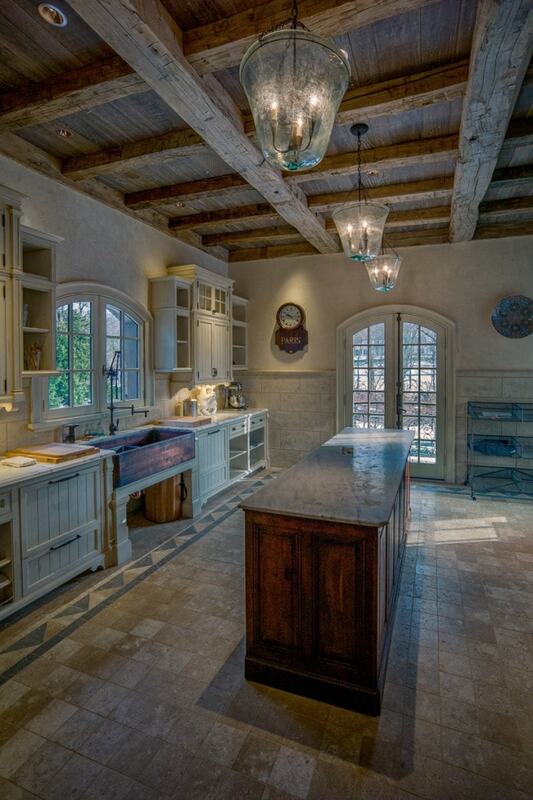 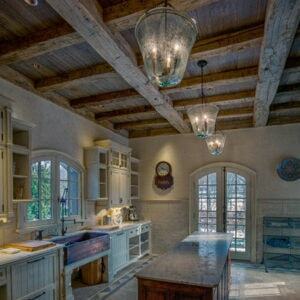 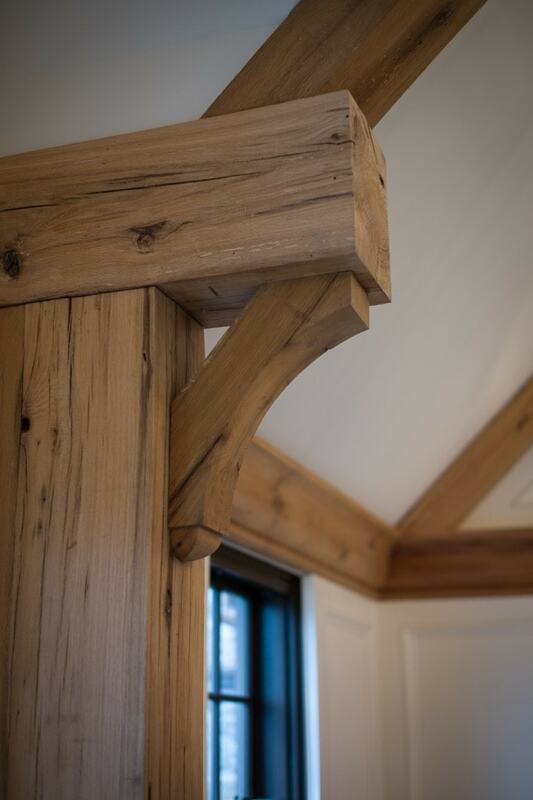 Aged beams and reclaimed planking form a striking ceiling in a Butler’s Pantry in Greenwich, CT. 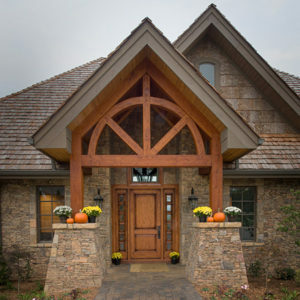 Note how the perimeter beam on the outside walls completes the look. 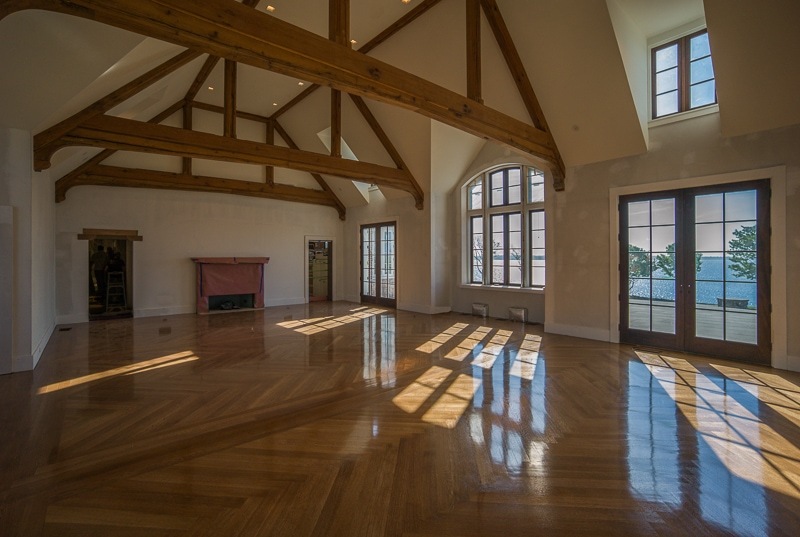 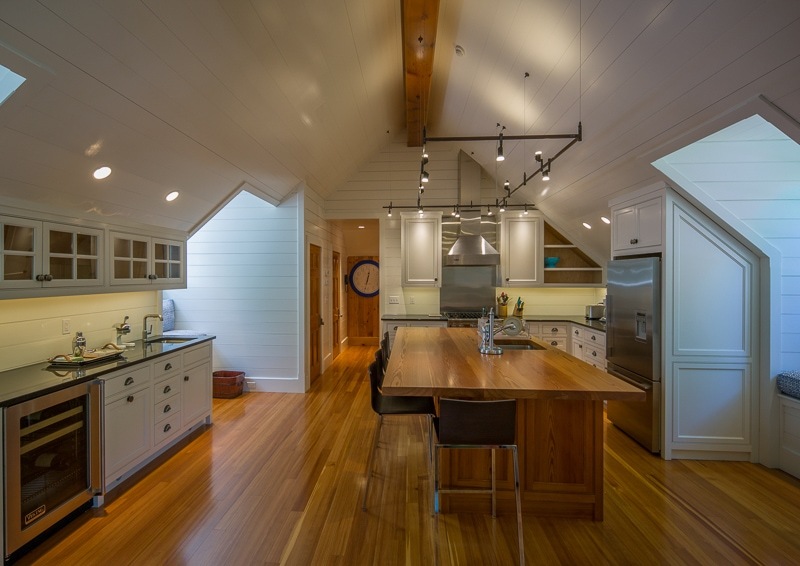 An exquisite guest house kitchen in Newport, RI with Heart Pine floors, island, and ridge beam. 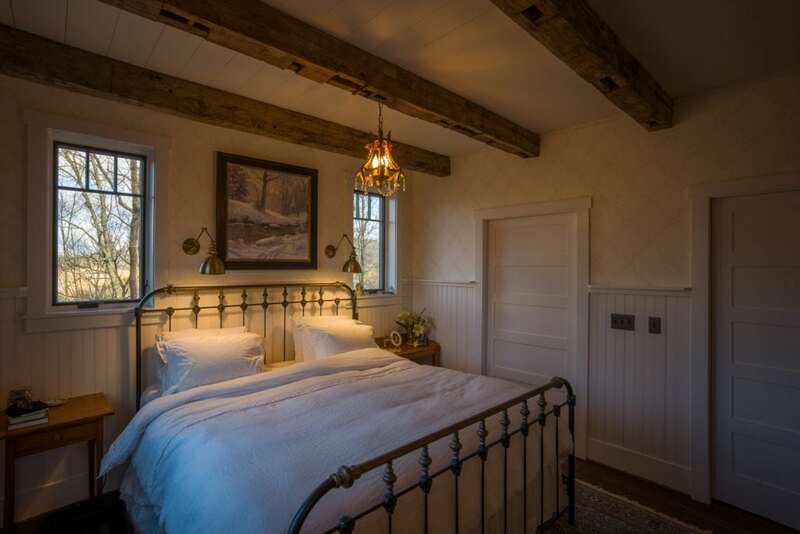 Note the nickel gap painted white ceiling boards. 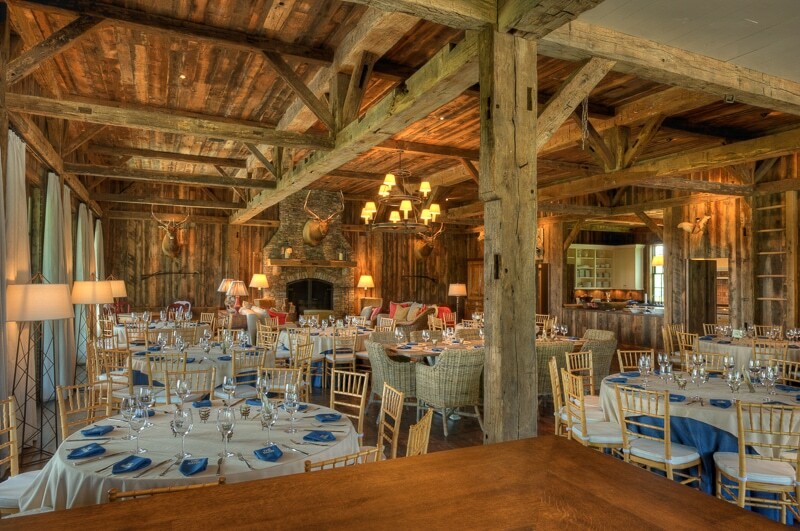 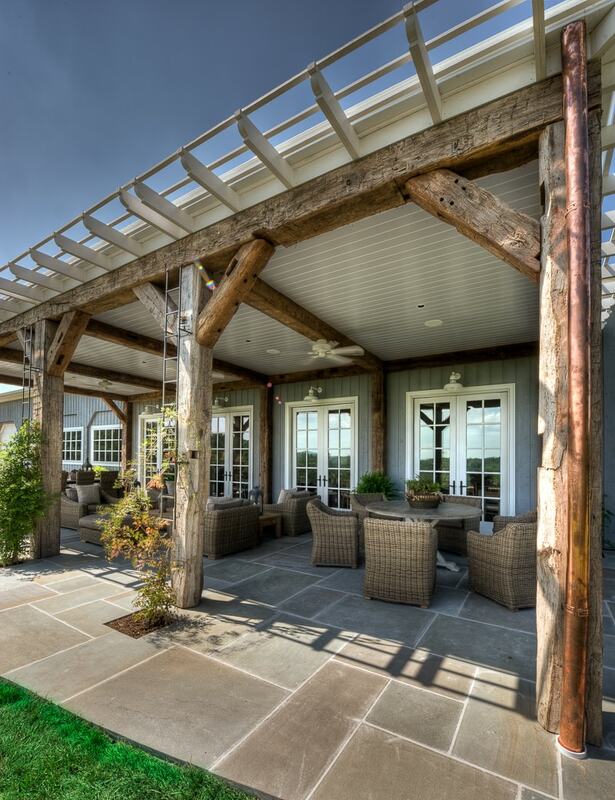 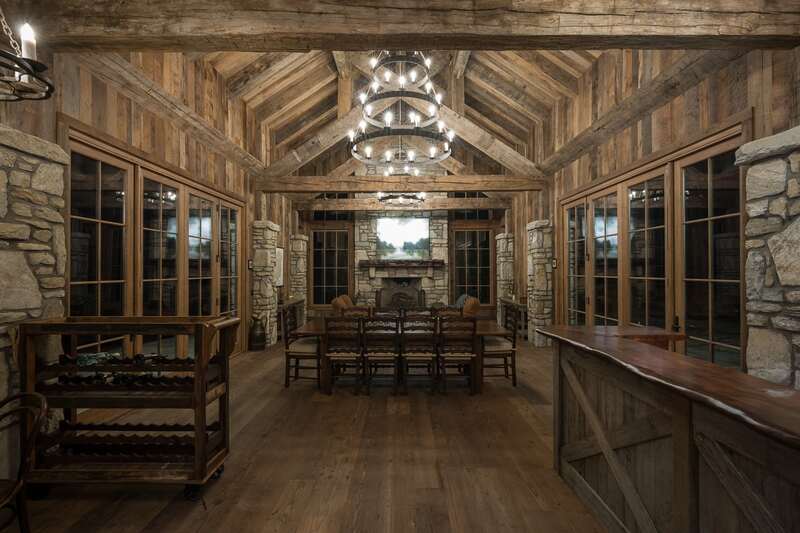 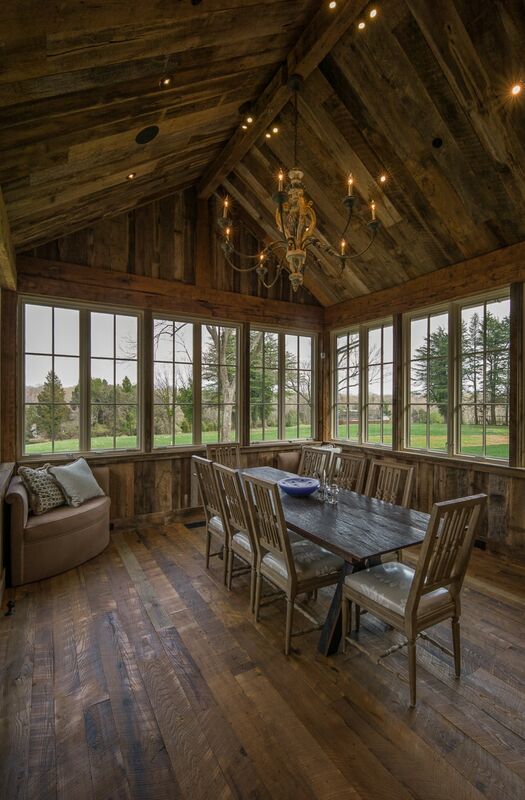 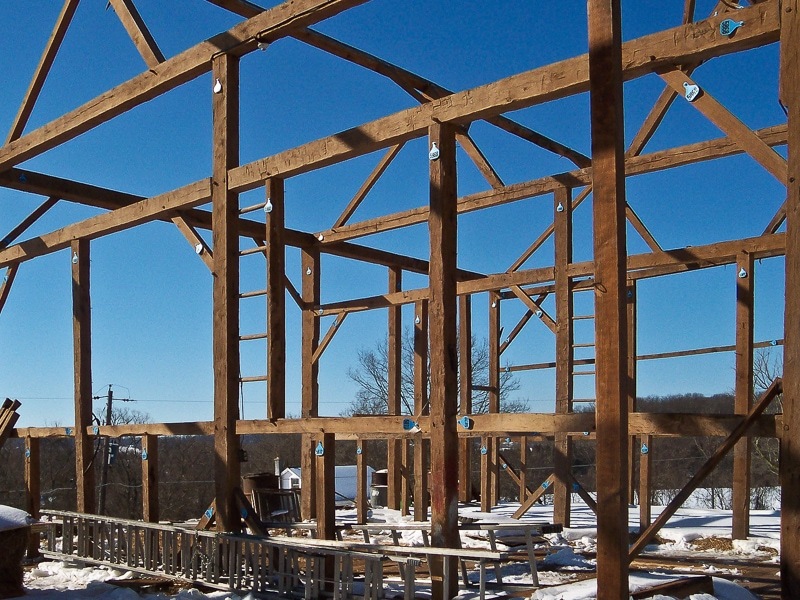 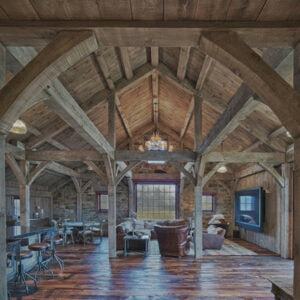 Inspired by a visit to Blackberry Farm, the owners converted part of an existing barn on their property to a gorgeous Party space–using reclaimed timbers from two Pennsylvania barns. 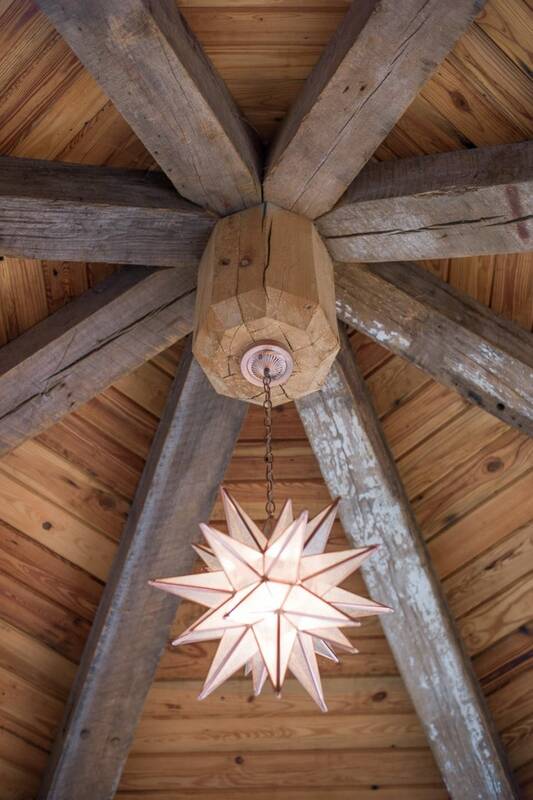 Design by Meyer Greeson Paullin Benson. 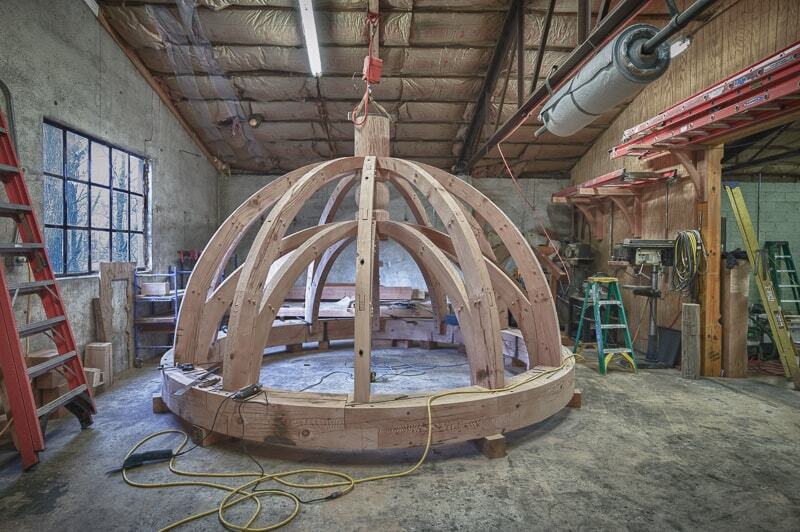 To read the Garden & Gun article about this project, visit the Our Story/Publications section of our website. 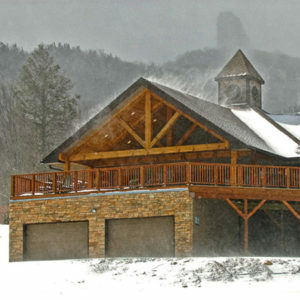 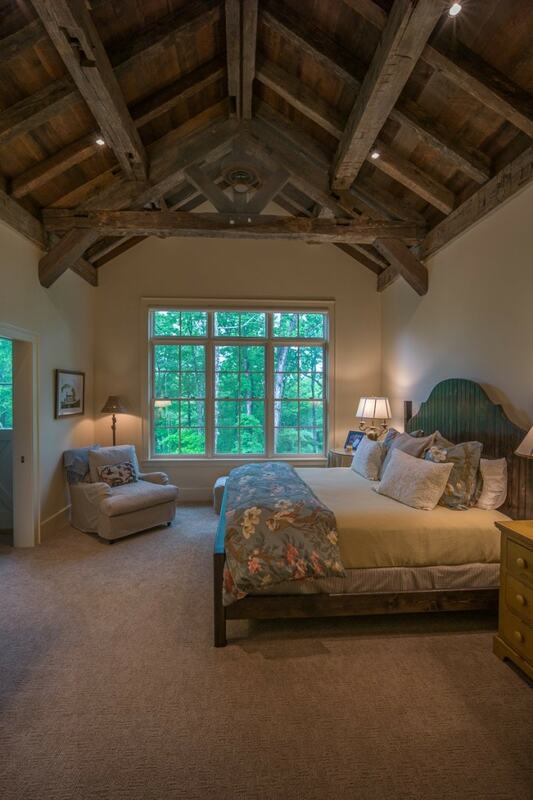 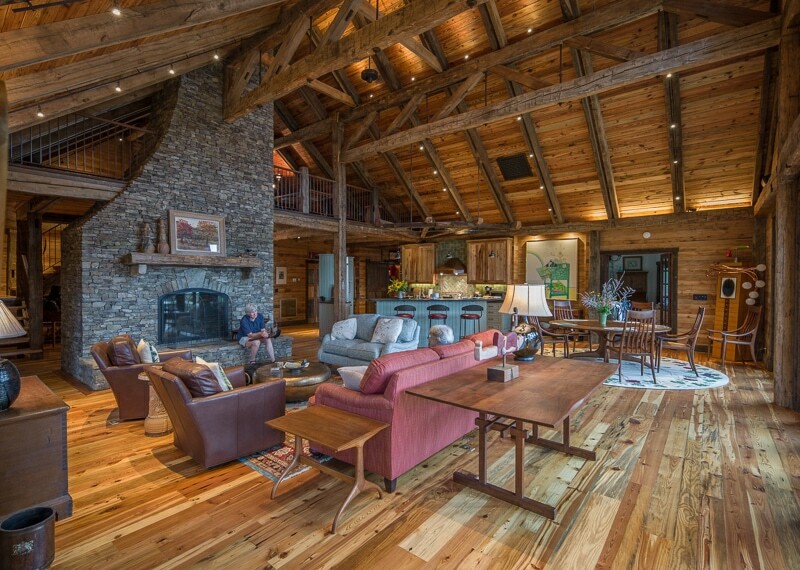 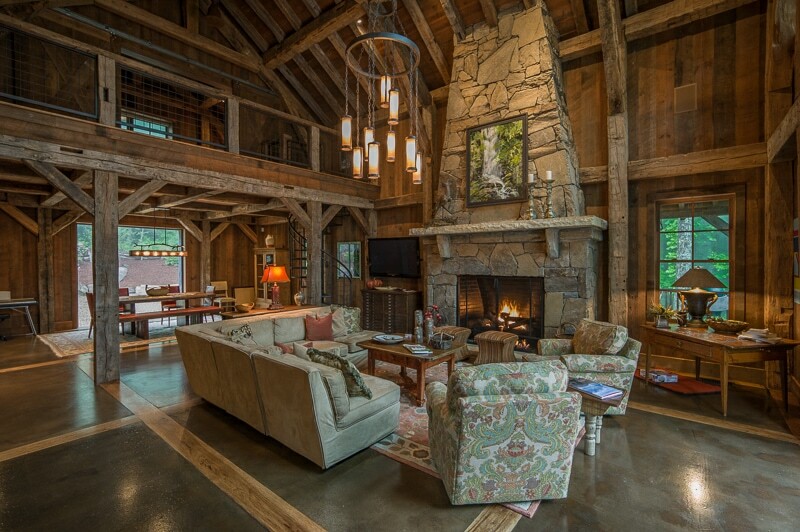 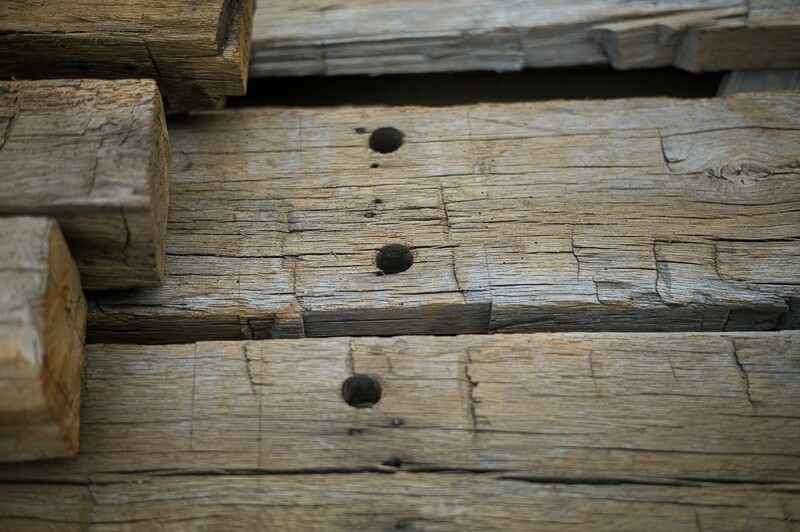 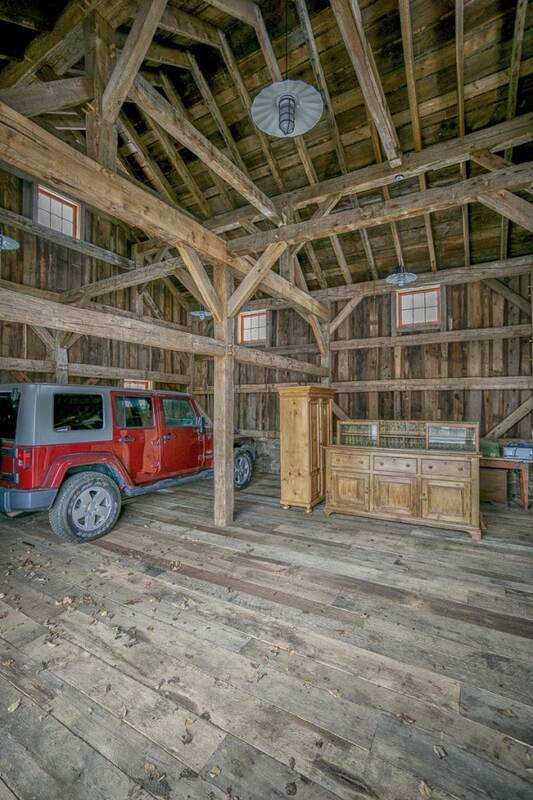 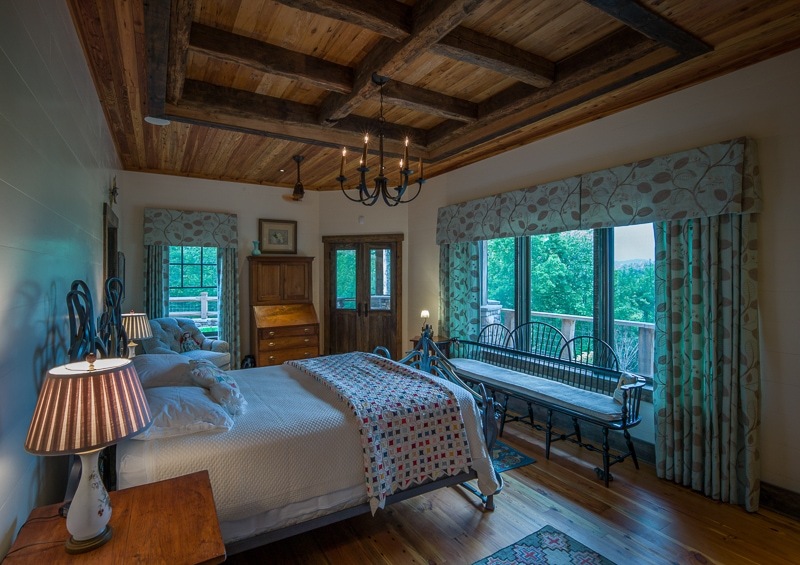 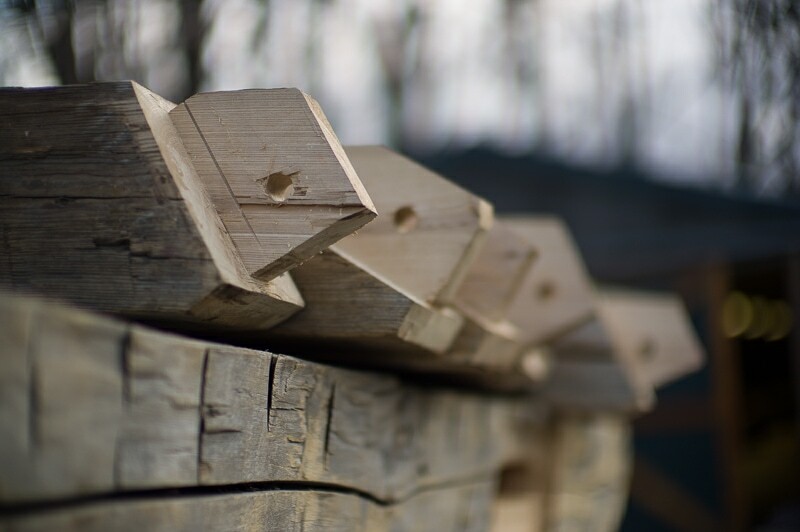 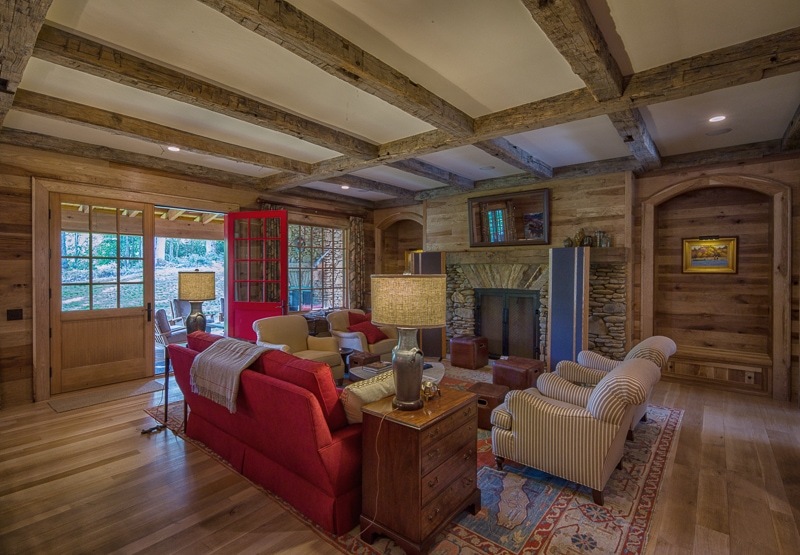 The rectangular holes (mortises) visible in some of the beams in this Linville, NC mountain home tell a story: these particular weathered beams were reclaimed from an antique timber frame (the timbers were connected by pegged mortise and tenon joinery)–as opposed to a post and beam structure (bolted or nailed together). 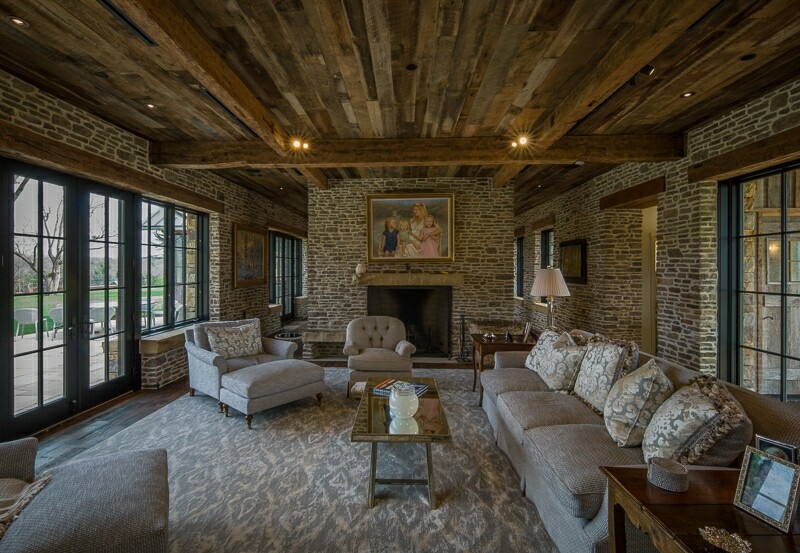 Weathered beams and siding reclaimed from the original house were re-purposed for this Living Room ceiling. 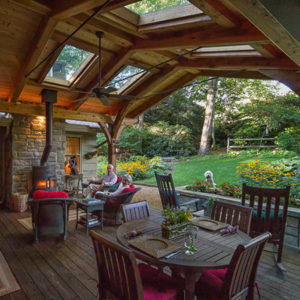 An octagonal exterior porch outside a master bedroom with a reclaimed wood ceiling. 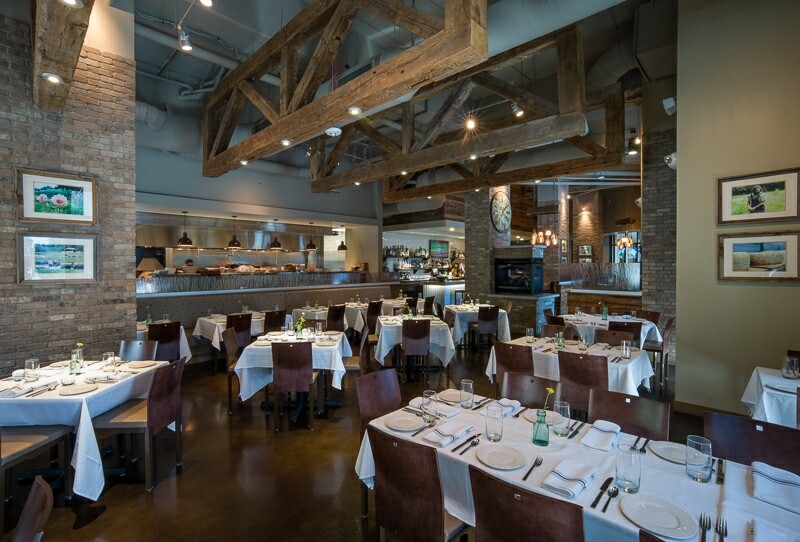 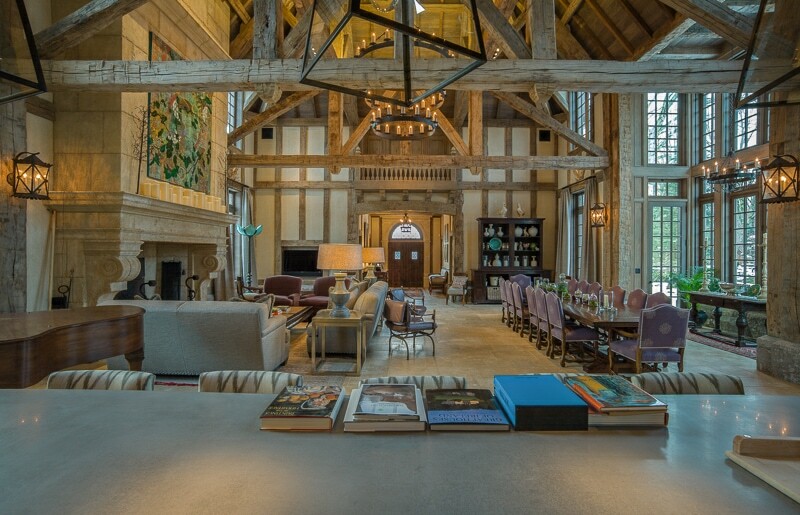 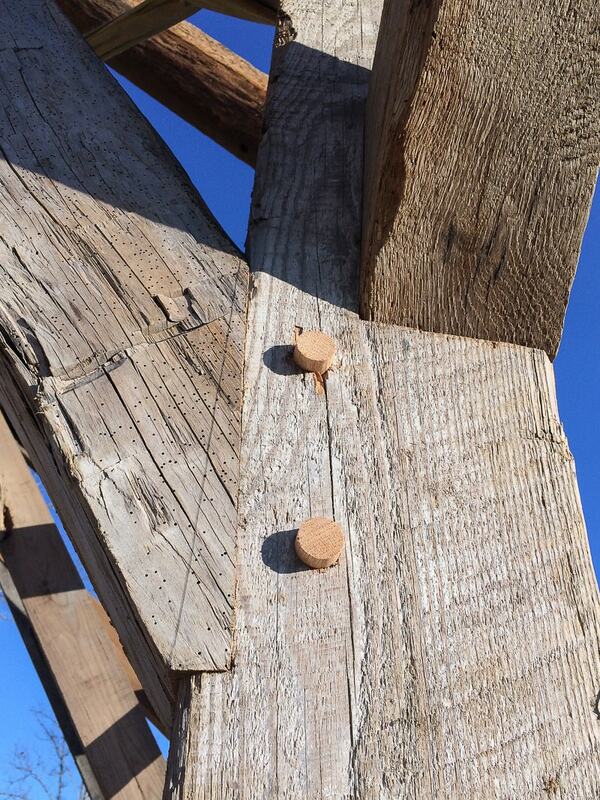 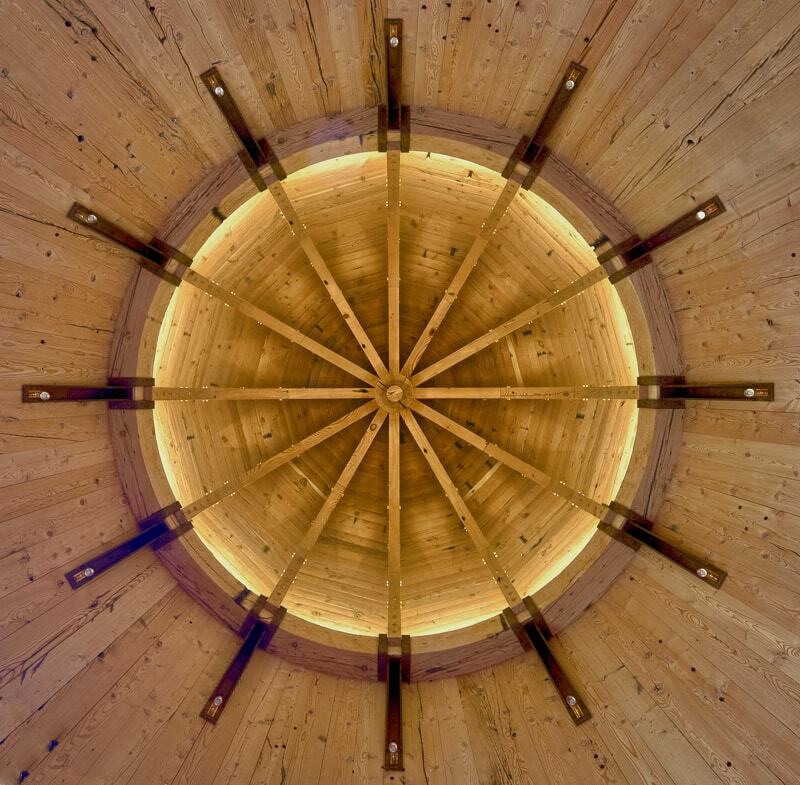 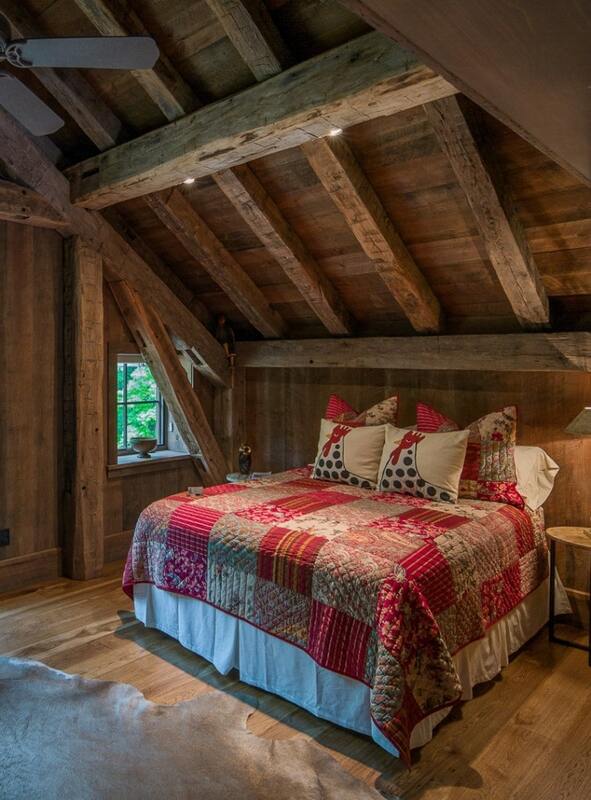 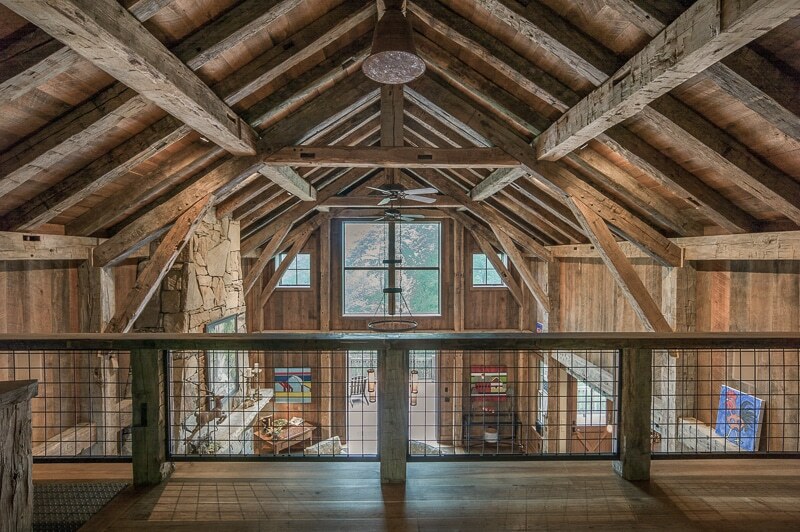 The ceiling boards are reclaimed heart pine and the circle sawn reclaimed timbers meet at an eight-sided boss pin. 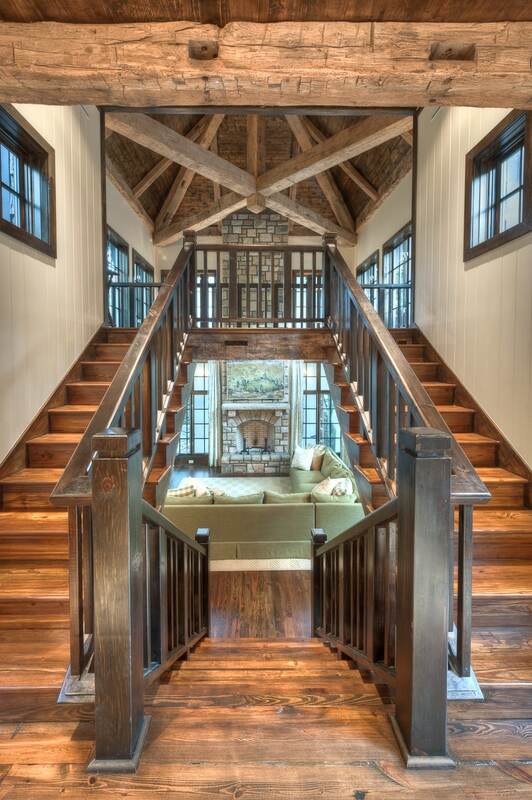 Almost everyone who visits our office comments favorably on the framed photograph of this stairway and the reclaimed wood beams above the Living Room. 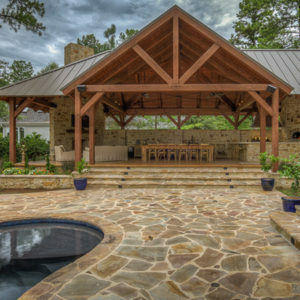 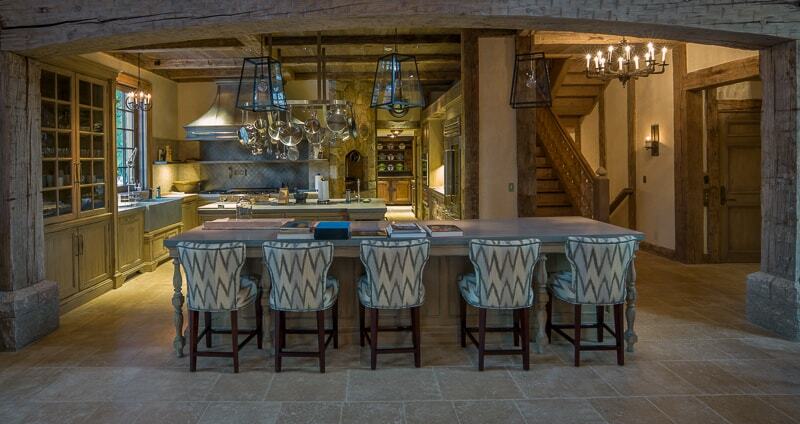 Design by T. Douglas Enoch Architect & Associates. 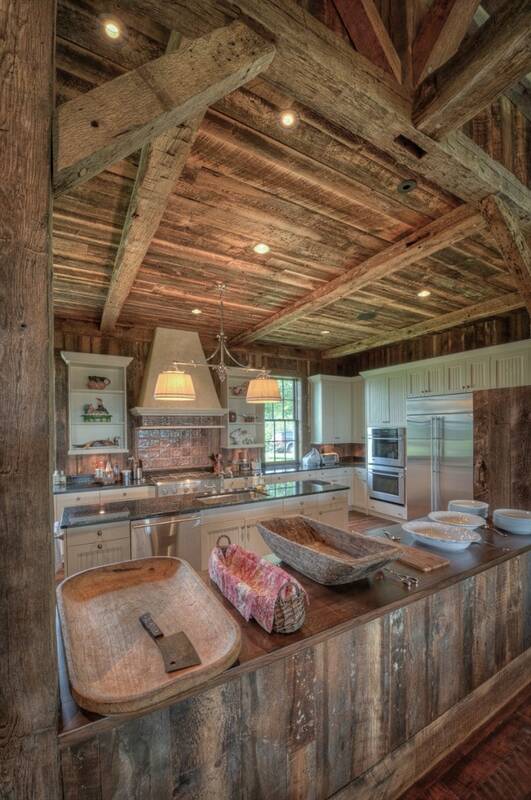 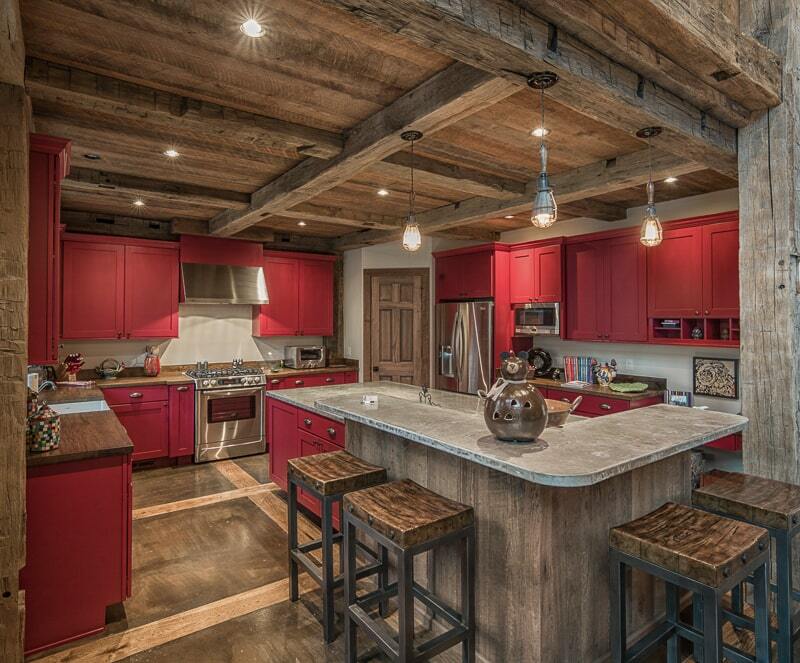 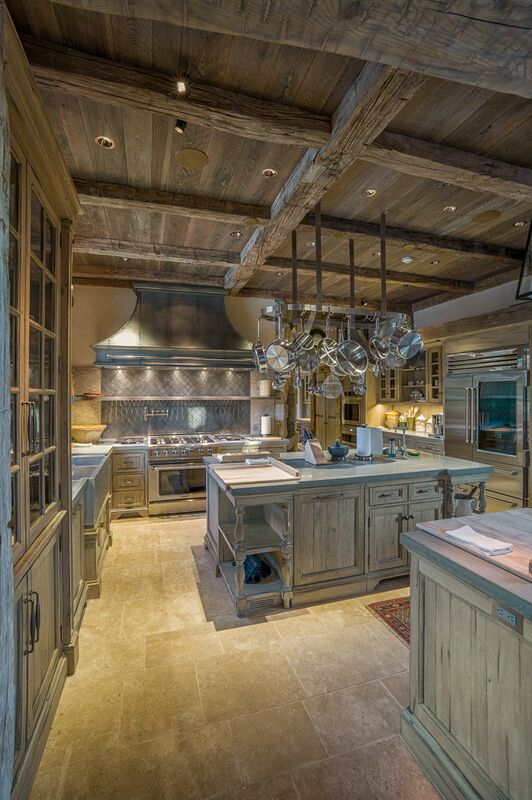 Reclaimed weathered hewn beams and brown barn board create a warm and welcoming Guest House kitchen in Greenwich, CT.